Haemotology is a discipline that identify the ecological and the physiologic situations concerning with aquatics and besides it helps to diagnose the diseases which are related with them (Şahan and Cengizler, 2002). Age, genital, season, method of hunting, sexual tiredness, length, weight, water temperature, pH, diet etc… affect the aquatics (Başusta and Şen, 2004). Decapoda (Crustacea), haemocyte in circulator takes on the task of both capturing and killing the infection agent and also synthesing of bioactive molecules and exotoxin releasing (Hose and ark, 1990). In the morphological works of cells three type haemocytes were identified. These are; hyaline, granule and semigranule haemocyte (Vazquez et al., 1997). As in the other Decapoda hyalines, there are three types haemocytes; hyaline, small granule, large granule in the circulatory system of Blue Crab (Clare and Lumb, 1994). Furthermore, while hyaline cells in crabs are responsible for production of phagocytes and reactive oxygen, in the other Decapod types, semigranule cells carry out this duty (Johansson et al., 2000). Blue crabs (Callinectes sapidus Rathbun, 1896) which are in Mediterranean, particularly from North-East Mediterranean are the most important crab types which are commercially important. Especially the crabs hunting in fishery workings which are located in Akyatan (Karataş) gained a commercial value and the crab processing workings which is near Karataş (Adana) began hunting and processing bussiness. Crabs are fisheries that were given high prices in developed countries in terms of meat and economy. Crab processing factories are common in these countries and there is an industry of it (Türeli,1999). Chitin attained from the crab shells is a biopolymer which is on demand in the world. Chitin and it’s primary derivative are used almost all areas (health, food sector, environment, energy and water) (Gümüşderelioğlu and Özdemir, 2005). By means of this study, haemolymph cell types available in individuals of Mature Blue Crabs growing in their habitat, fishery in Akyatan and their amounts in ml were identified. Their sexual, carapace length and weight relations were tried to be determined. The input attained from mature individuals and haematological information that would be a basis about populations were tried to be obtained. Contribution to eliminate of shortness of information that would be a basis to this area was aimed. Furthermore, at least this study will suggest an idea to ecologic, immunologic; disease and cultivation studies will be done in the future. The samples were taken from Akyatan Lagoon fisherman between June 2005 and September 2005. Because of this, environmental factors such as water temperature and saltness were not taken into consideration. The samples were processed from parasitary and macroscopic analysing and this analysis was conducted on the individual that were thought as healthy. To identify the amount and the type of haemocyte , 93 females and 134 males, totally 227 mature individuals were used. The sample of haemocyte was taken from the crab’s fifth walking leg. With the injector in which there was 0.2 ml anticoagulant (100Mm EDTA, 100Mm Glucose, 145 Mm NaCl, 30 Mm Tri sodium citrate, 26 Mm Citric acids, pH 4.6) sample was taken from each individual. After the sample of anticoagulant was mixed it was applied to Thoma slide and this sample was analysed with the microscope’s x40 magnification. Classification of haemocytes, total and differential heamocyte amounts were done according to Yıldız and Atar (2002). After the microscopic examination, the individual weights were measured on the scale that was sensitive to 0.05gr. Moreover, by making gender distinction their morphometric measures were taken. These are carapace width (CW) and carapace length (CL). Morphometric features, total haemocyte amount, mean belonging to types and standart error were measured by means of SPSS10.0, packet program (SPSS, 1999). 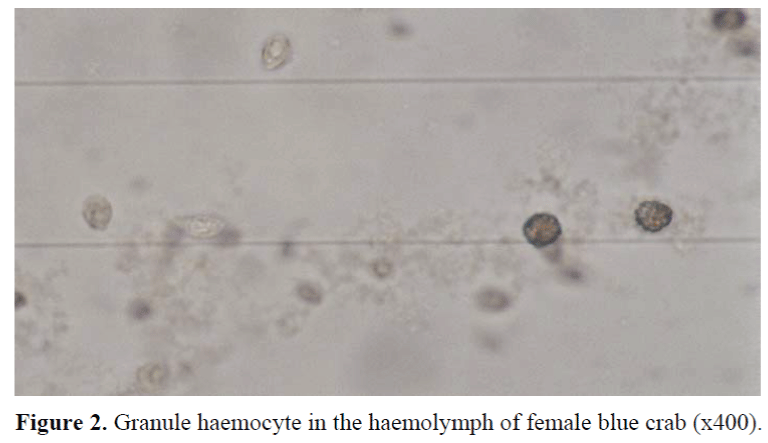 By doing variance analysis, morphometric inputs (carapace length, carapace width, weight) and total haemocyte amount in ml according to gender and their relations with haemocyte types were identified. Three haemocyte types as hyaline, semigranule and granule were identified in the analysed individuals. As well as Hyaline haemocytes are mostly lack of granules, they sometimes include few granules. Furtheremore in addition to that hyaline haemocytes have high nucleocytoplasmic rate, they have a characteristic nucleus (Figure 1). Granule haemocytes are oval or in circular shapes and they are in great number (Figure 2). And the semigranule haemocytes have less number of granules, generally in oval shapes and lower nucleocytoplasmic rate (Figure 3). The average figures about total haemocytes and haemocyte types that were measured on males and females were given in the table 1). Standart errors and average figures about Carapace length (CL), Carapace width (CW) and weight (W) measured on males and females were given Chart 2. Figure 1. Hyaline haemocyte in the haemolymph of female blue crab (x400). Figure 2. Granule haemocyte in the haemolymph of female blue crab (x400). Figure 3. Semigranule haemocyte in the haemolymph of male blue crab (x400). Total and differential haemocyte amouts change in Crustacean and crab types, depending on many factors. These are: type, gender, number of exemplification, the state of the region where it is caught, season, laboratory conditions, different methods employed in caunting, the physical features of the water. The studies previously done on Blue Crab in natural environment conditions haven’t benn able to be obtained. However, the research on Decapoda types has been reached and comparisons have been done. In sum, three types haemolymph cell as hyaline, granular, semi-granular have been identified. While hyaline haemocytes are deprived of granules, they sometimes include it in little amounts. Moreover hyaline haemocytes have both nucleocytoplasmic in high rate and a certain nucleus (Figures 1). Granule haemocytes contain granule in high numbers and they are in oval or round shapes (Figure 2). Semigranule haemocytes include granule in lower numbers and they are generally oval and have low nucleocytoplasmic rate (Figure 3). It has been determined that semigranule cells are dominant with 55% rate in all individuals and these are followed by granule ones with 31% rate and hyaline ones with 14% rate. It has been counted as follows: in male individuals, on average ml hyaline is 21.447 ±0.609x104, semigranule is 112.355 ±3.058x104, and granule is 82.632 ±2.080x104; in female individuals’ hyaline is 25.722 ±0.916x104, semigranule is 125.817 ±4.847x104, granule is 91.078 ±3,047x104. In adult males, total haemocyte amount is 216.434 ±4.778x104 on average ml in female ones it is 242.300 ±6.113x104 has been found out. Hose et al., (1990) named cells as the one with big granules, with small granules and hyaline haemocyte in Homarus americanus, Panulirus interruptus and Loxoryhynchus grandis from Decapod Crustacea. They declared that the rates of the one with granules, small granules and hyaline haemocytes were respectively 16.4% ±2.7, 60. 2 % ± 3.6, 22. 4% ±2.4 in Homarus americanus; 9.8 % ±2,6, 29.2% ±3.6, 61.0% ± 3.4, in Panulirus interruptus; 14.1% ±2.3, 67.8% ±5.3, 18.1% ±3.8 in Loxorryhynchus grandis. Clare and Lumb (1994) made three divisions of haemocytes as Blue Crab (C. sapidus) hyaline, the ones with small granules and the one with big granules. They counted the differential cell results in cells painted with H&E(375 individuals) as hyaline (46,56%), the one with small granules, (29,71%) and the one with the big granules (24.71%) They determined that the rates of hyaline , the one with small granules, the one with big granules cells painted with Toludin blue (569 individuals) were respectively 48.05%, 30.66%, 21.3%. Hyaline cells have high nucleocytoplasmic rate and they are distunguished by the fact that they have granule in little amounts and they showed the shapes of hyaline haemocytes as elipsoid. They differentiated the haemocytes with the small granules as they had oval shapes and small granules in alow high nucleocytoplasmic rate. They indicated that cells with big granules were determined due to the fact that they had similar features and bigger granules. Jussila et al., (1997) found three types of haemocytes as hyalinoceat, semigranuleceat and granuleceat in red western lobster, and that total haemocyte amount ranges from 2.5x104 to 15.9x106 cell/ml. Gargioni and Barrocco (1998) classified haemocytes as hyaline, the one with small granules and the one with big granules in Macrobrachium rosebergii, M.acanthurus, Penaeus paulensis individiual. They found that hyaline cells were in 17%, 20%, 41% rates. The one with small granules in between 29%, 20%, 33% rates. They declared the total haemocyte number as between 44.523± 6.236 in hyaline cells, 1.946 ± 514 in the ones with small granules, 18.878 ± 6.353x104(ml) in the ones with big granules. Yıldız (2001) counted the total haemocyte number after 24 hours, 48 hours, 2 weeks, 4 weeks as 43,00 ± 2.29, 23.28 ± 1.36, 19.00 ±1.25, 15.00 ± 1.47x104 ml respectively in total 45 Fresh water Lobsters after and before hunger. In female ones with the average CL 60.715 mm, KW 106.368 mm and 147,884 g weight hyaline haemocyte amount on average is 25.772 ±0.916x104 , semigranule is 125.817 ± 4.847x104 , granule is 91.078 ±3.047x104 (Table 1,2). It has been found that total haemocyte amount is 216.434 ±4.778x104 on average ml in male individuals and 242.300 ±6.113x104 as seen in table the total haemocyte amount in female individuals has been found higher than that of male ones (P<0.05). Yıldız and Atar (2002) identified the haemocytes in the shape of hyalinocytes, semigranulocytes granulocytes in the Fresh Water Lobster (Potomon fluviatilis) and found the total haemocyte amount as 10.53x105 at least and 13.9 x105 at most. Although the values of weight carapace length, carapace width of female individuals are lover than those of male ones, total haemocyte, hyaline, semigranule, granule values are found to be higher. That it is related to reproduction period has been thought. Türeli (1999) has stated that the reproduction activity of male individuals continues intensively throughout the whole year; on the other hand, it continues intensively from March to September in female ones. Our research has been conducted on the individuals that are thought to be healthy in natural environment conditions. Thus, total and differential hemolymph cell values of the individuals existing in our region’s fish traps and exported have been put forward. Additionally, obtained findings are thought to provide a source for the research to be done. It must not be forgotten that total and differential haemocyte amounts can change depending on the factors such as gender, water temperature, crust change period and hunger (Yıldız and Atar, 2002). For this reason, that such a research must be conducted more extensively, taking the biological (like crust change, disease) features of Crab, with utmost care to environmental conditions such as temperature, saltiness, pH into account is suggested. I would like to thank to Prof.Dr HijranYAVUZCAN YILDIZ from Department of Aquaculture, Faculty of Agriculture in Ankara University for her valuable advice and encouragement. Başusta, A., Şen, D., (2004), Keban Baraj Gölü’nde Acanthobrama marmid, Heckel,1843’de Kan Parametrelerinin İncelenmesi, Turkish Journalof Veterinary and Animal Sciences, 28:1-6. Clare, A.S., Lumb,G., (1994), Identification of haemocytes and their role in clotting in the blue crab, Callinectes sapidus, Marine Biology, 118: 601-610. Gargioni, R., Barraco, M. A., (1998), Hemocytes of the Palaemonids Macrobrachium rosenbergii and M. acanthurus and of the Penaeid Penaeus paulensis. Journal of Morphology 236: 209-221. Gümüşderelioğlu, M., Özdemir, E., (2005), Kitin ve Kitosan. Bilim ve Teknik Dergisi, 38: 80. 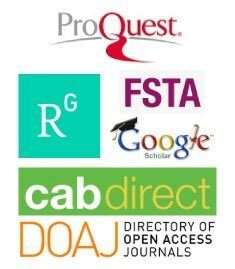 Hose., E. J., Martin., G. G., Gerard., S. A., (1990), A Decapod Hemocyte Classification, Scheme Integrating Morphology, Cytochemistry and Function. Biology Bulletin, 178:33-45. Johansson, M., Keyser, P., Sritunyaluckasana, K., Söderhall, K., (2000), Crustacean haemocytes and haematopoiesis. Aquaculture, 191: 45-52. Jussila, J., Jago, J., Tsvetnenko, E., Dunstan, B., Evans, L.H., (1997), Total and differential haemocyte counts in westwern rock lobster (Panulirus cygnus George) under postharvest stress. 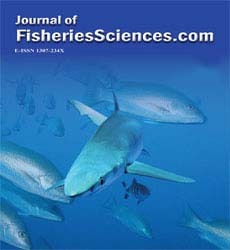 Marine Freshwater Research, 48: 863-867. Smith , J. V., Brown , H. J. , Hauton, C., (2003), Immunostimulation in Crustaceans: does it really protect against infection ? Fish and Shellfish Immunology, 15:71-90. SPSS, (1999), Computer Program , MS. For Windows , Version 10.0.1. SPSS Inc.
Şahan, A., Cengizler, İ., (2002), Seyhan Nehri (Adana Kent İçi Bölgesi)’nde Yaşayan Benekli Siraz (Capoeta barrosi Lortet, 1894) ve Kızılgöz (Rutilus rutilus Linnaeus, 1758)’de Bazı Hematolojik Parametrelerin Belirlenmesi. Turkish Journalof Veterinary and Animal Sciences, 26: 849-858. Türeli, C., (1999), İskenderun Körfezi’ndeki Mavi Yengeç (Callinectes sapidus) RATHBUN, 1896’un Bazı Biyolojik Özellikleri, Doktora Tezi, Danışman Erdem, Ü., Çukurova Üniversitesi Fen Bilimleri Enstitüsü, Su Ürünleri Anabilim Dalı, Adana. Vazquez, L., Perez, A., Millan, D., Agündis, C., Martin, G., Cooper, E., Lascurain, R., Zenteno, E., (1997), Morphology of Hemocytes From the Freshwater Prawn Macrobrachium rosenbergii. Journal of Morphology, 234:147-153. Yıldız, H., (2001), Açlık Stresi Altında Bulunan Tatlısu istakozu (Astacus leptodactylusn Esch. )’nda Toplam Hemosit Sayıları. Süleyman Demirel Üniversitesi Eğridir Su Ürünleri Fakültesi Dergisi, 7: 56-60. Yıldız, H. Y., Atar, H., (2002), Tatlısu Yengecinde, Potamon fluviatilis Hemosit Sınıflandırılması ve Diferansiyel Sayıları. Turkish Journalof Veterinary and Animal Sciences, 26: 403-406.